Free Agency is heating up, with a blow for the New England Patriots in their search for additional help rushing the passer. 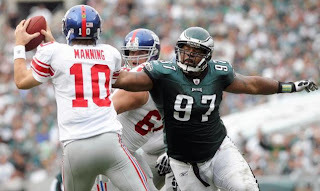 NYG have signed DT Cullen Jenkins to a three-year deal for $8 million, $3 million guaranteed. Nice pickup. He's 32, so he's still got a bit left in the tank (he only got cut by the Philadelphia Eagles because he no longer fitted their scheme). He's a Defensive Tackle who is certainly able to rush the passer, which certainly would have made him and Vince Wilfork, a prominent run stopper, quite the combination. And at that money, he wouldn't have taken a huge hit on our cap for a guy who can have an immediate impact on the team. The rich have gotten richer. Aren't Jason Pierre-Paul and Justin Tuck enough for those pesky Giants? As for the Patriots, well, they have made moves to try and increase the pass rush, having made moves for two Defensive Ends from Canada (remember those guys? ), but they certainly need to upgrade the number 2 DT - Kyle Love and Brandon Deaderick are solid back ups, but not NFL starters. So the Patriots might just look to a deep defensive line draft class to fill the gap.